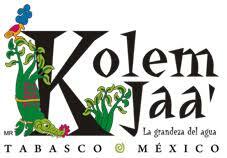 Our first stop is Kolem Jaá, in the foothills of the Sierra Madre, It comprises some 27.5 hectares of reforested jungle, dotted with waterfalls. It took seven years to build, (it opened to the public in December, 2003) and is breathtakingly beautiful. Kolem Jaá (which means the grandeur of the water) is reached by motor launch. A small cluster of very clean, thatched-roof cabanas provide accommodation. Meals are basic but very tasty and plentiful. However, the adventure that awaits is unforgettable. Ready for our ziplining adventure. 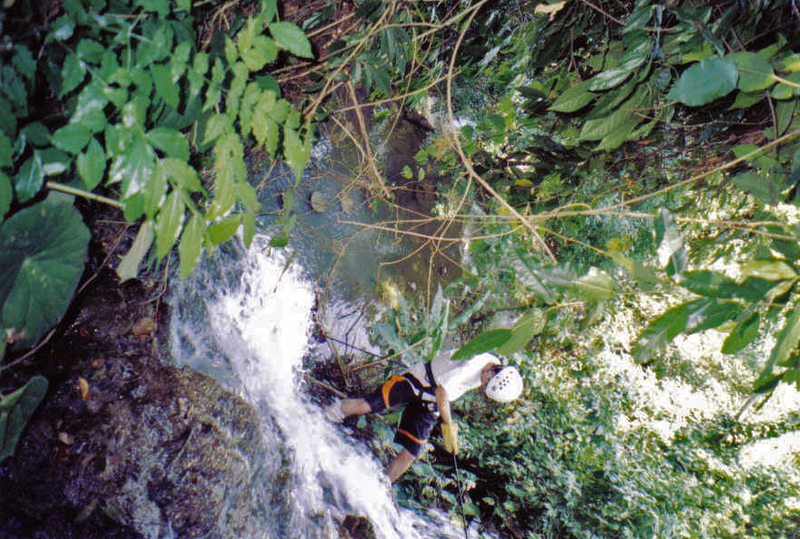 Our first morning, we tackled the canopy trail. 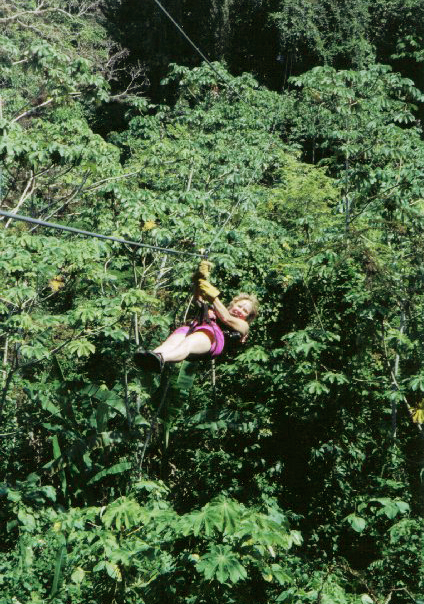 The camp’s director reassured us, “This is the highest – and safest – canopy trail in Latin America.” So off we went. High above the forest floor, a series of 11 platforms have been constructed in the trees, 30 to 40 metres above the ground. These are connected by a series of wires. An elaborate leather harness with your own flywheel connects you to these wires in turn, allowing you to zing between platforms. The leather gloves they provide allow you to slow yourself so you can get a good look around the forest as you zip along. What an unforgettable experience! I couldn’t resist the opportunity to visit the Cave of the Blind Sardines, which contains 13 caverns, each of which has its own self-contained ecosystem. The cave is a kilometere away and I opted to ride there on horseback. One can also mountain bike or walk. 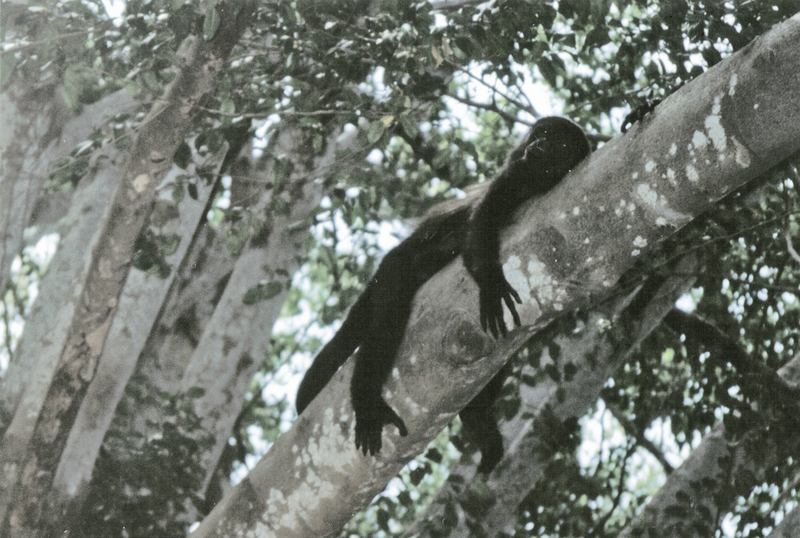 The route offers gorgeous vistas with unusual plants, streams and some interesting fauna including plenty of howler monkeys in the trees. 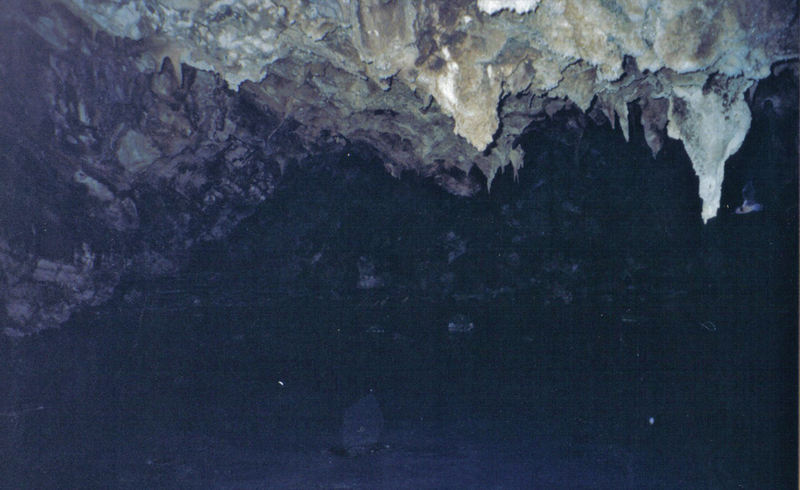 Inside the Cave of the Blind Sardines, it’s eerily dark – which is why the sardines have evolved without vision. It’s unnecessary. 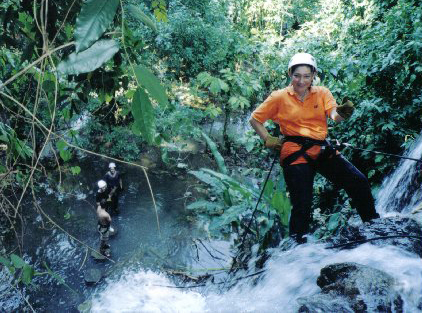 Magdalena rappels down the waterfall. 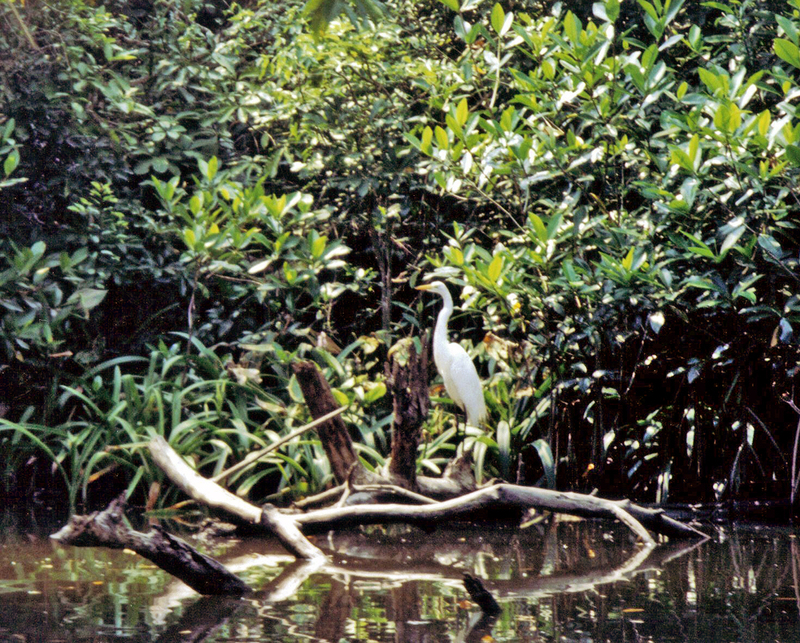 A heron poses on the edge of the mangrove in Punta Manglar. The next stop for a dedicated ecotourist has to be Punta Manglar – 300,000 hectares of protected mangrove swamp, about an hour out of nearby Villahermosa. Rare species of turtles, birds, and fish make their home here and others such as manatees and sharks have been spotted. Depending on the part of the swamp, the mangroves are black, white or red; the colour changes are distinct. Yumká is a nature interpretation centre near Punta Manglar. The Yumká guide transported us by motor boat to the swamp where we transferred to silent canoes and were paddled into its depths. This is an area teeming with life – several species of heron, kingfishers, blue morph butterflies, cormorants, and much more. The swamp is also home to alligators and the extremely rare jaguar whose roar has often been heard by locals. 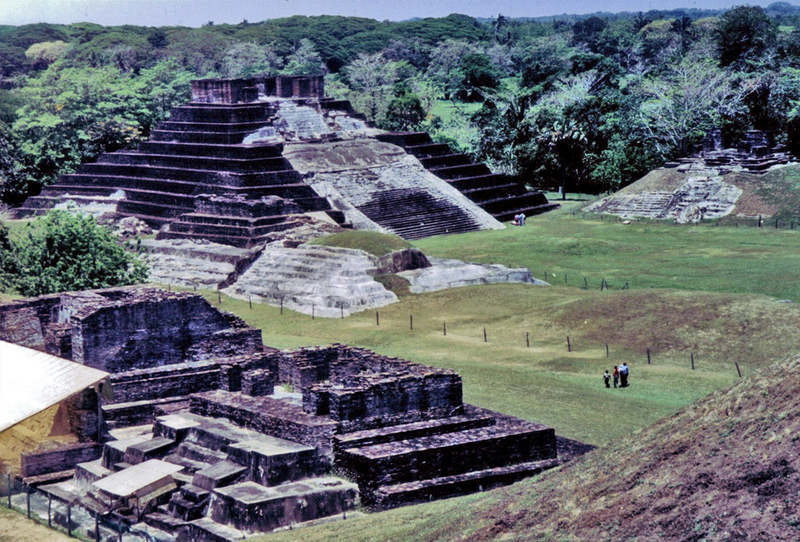 The final stop is Comalcalco, an ancient Mayan Archaeological site about an hour from Villehermosa. It is the only major Mayan city built with bricks rather than limestone masonry and is different from most other Mayan ruins throughout Mexico. 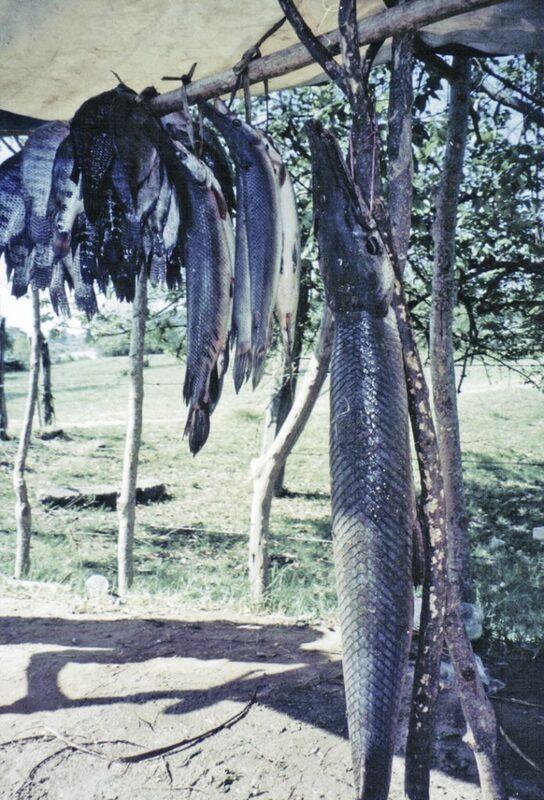 I found myself intrigued by this fish we saw for sale by the roadside. Péjelagarto is a fish with an alligator snout, found only in this one area. It apparently has a distinctive, very tasty flavour. Sadly I didn’t get an opportunity to try this. Next trip perhaps? 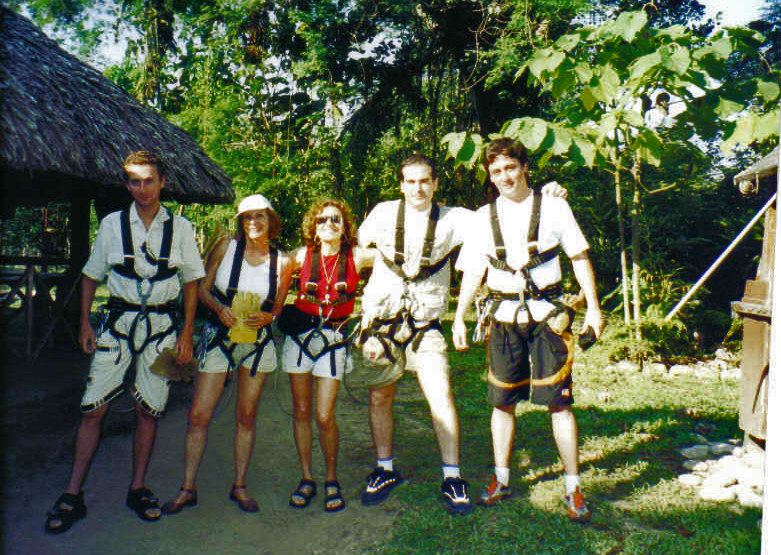 This entry was posted in Mexico and tagged canopy trail, Cave of the Blind Sardines, Comalcalco, Kolem Jaá, mangrove, Mayan archaeology, Mayan ruins, monkey, Punta Manglar, rappelling, swamp, Tabasco, wildlife, Yumká, zip lining by Liz Campbell. Bookmark the permalink.